Embark in an incredible adventure that will take you beyond the farthest corner of Earth. A crisp and beautiful tale rooted in our current environmental reality that will open your heart and your eyes. A story that will linger in the back of your mind long after the end. 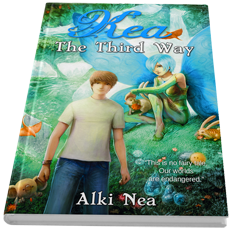 Brimming with action, friendship and emotion, Kea, The Third Way introduces the reader to a serious, contemporary problem: the sixth extinction. Ages 9-13. Adventure, action, humor, and environmental awareness. 310 pages. Very enjoyable. It was great for once to read a fantasy that was not filled with gross blood sucking vampires, witches and wizards. Instead it was magical story with love and purity that left me wondering if only such a world would exist. I love any good story that has a great message to share, and an author who can relay that message through an intriguing story that keeps my interest from beginning to end. 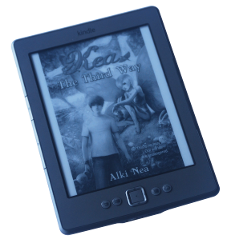 ...a fun and exciting story with some amazing and other-worldly adventures. What a wonderful, powerful story! So imaginative, and with a very important message, without talking down to the kids who will be reading it. I very much appreciate fiction that accomplishes something important, and I believe this book does just that. Autumn J. Conley ~ Book editor. I really like action books that have humor mixed in to make the tense scenes less tense. Leo was a great main character. He was an average boy, smart, kind, and helpful. Kea was cool… no… awesome! She had a great personality. I think boys and girls would like the story. I recommend this book to kids 10+! How can I describe the book? It all started when Kea and Leo came to visit at the end of last summer. They were in their early teens, but talked as adults who've been through a lot. And they had! They wanted me to write their story. Kea said it had deep implications for the future. I only understood what she meant when she opened her ... I'm carried away; I should start from the beginning, after Kea's house burnt mysteriously and they had to flee from a dark organization that hunted them farther than New York, and ... No, hold on, that's not the most important. What is, is how solemn Kea was that day when she explained me that some things are difficult to understand when you are standing in the middle of it. You have to step aside and see it from a different perspective to comprehend its nature and significance. For Kea, she had to go into a mystifying world to understand how alarming the Sixth extinction is. And we are all responsible. This is her story. If you want to review the book, don't hesitate to contact me (see below contact link.) Don't forget to send me a link to your review blog.